The minimum required return on a new investment. The appropriate discount rate on a new project is the minimum expected rate of return an investment must offer to be attractive. This minimum required return is often called the cost of capital associated with the investment. It is called this because the required return is what the firm must earn on its capital investment in a project just to break even. 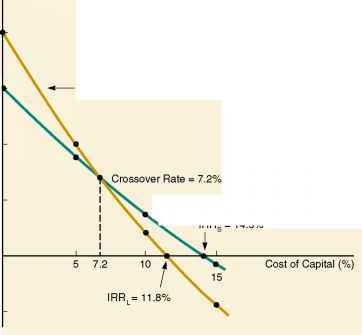 It can thus be interpreted as the opportunity cost associated with the firm's capital investment. Notice that when we say an investment is attractive if its expected return exceeds what is offered in financial markets for investments of the same risk, we are effectively using the internal rate of return (IRR) criterion that we developed and discussed in Chapter 9. The only difference is that now we have a much better idea of what determines the required return on an investment. This understanding will be critical when we discuss cost of capital and capital structure in Part 7 of our book.